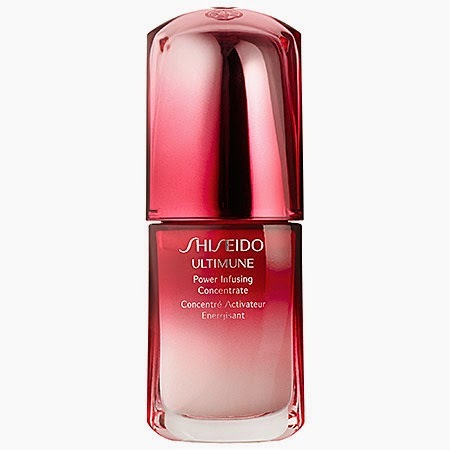 The first thing that caught my eye when I saw Shiseido ULTIMUNE Power Infusing Concentrate was the red metallic futuristic "bullet" packaging. But as soon as I tried this once, I was hooked on the fluid inside the bottle. The concentrate is a product that is meant for a "layering" skin care regimen. After you cleanse and before either serum or serum/moisturizer, depending on your skin type. The product is a serum/lotion hybrid with an amazing, fresh scent. It is in fact, very concentrated, so about a dime's worth was enough for not only my face but my neck as well. The concentrate felt silky smooth and absorbed into my skin instantly. It hydrated my skin, but the finish was a "natural sheen" with no oily or sticky residue. After using in combination with my regular routine, after just a few weeks, I could see that my skin tone was more even, my t zone more regulated and my pores were smooth. I used this 2x day after cleansing and while it was an additional "step" I didn't mind it at all. If I had some time in the evening, I would also use it while I gave myself a facial massage, which was really nice to do with the scent and consistency. If you have normal/slightly dry skin, after using the concentrate, you may not have a need for anything more than a hydrating primer before adding your makeup. If you have dry/very dry skin, you will need a moisturizing layer after using the concentrate. And the beauty of the concentrate is that is actually strengthens the performance of the products you layer over it, like moisturizer.